I'm really please to have Joe Kipling, author of Blinded by the Light, stop by to talk about her book cover. I love all things to do with book covers - it amazes me what a difference they can make and I absolutely love to hear what authors think of their own covers! I titled this blog ‘when the vision becomes reality’ because I feel that as a writer you create a vision of the world that you want to share with your readers and an important part of sharing this vision is the cover art. The cover is the reader’s first introduction to your story and it can communicate so much. It is often the book cover that is the deciding factor in whether the reader picks your book up off the shelf - or as we’re in the 21st century, press ‘click to buy’ online. As a debut author I found the whole process of cover design really interesting. Watching the transformation from the initial pencil drawings to the finished piece was fascinating. At the start of the process I had a very definite idea about the ‘look and feel’ that I wanted for the book cover. Well, needless to say the finished product looks nothing like I envisaged it. It taught me an important lesson . . .to stick to writing and leave the artwork to the professionals. Having a cover artist who really understands your story and fully embraces the world you’ve created is, for me incredibly important. While working on Blinded by the Light I was very lucky to have had the opportunity to work with a really talented artist called Billie-Jade McNeil. At our first meeting I was impressed that Billie-Jade had clearly read the book and had carefully thought through each of the 4 concepts she’d developed. This quote was the inspiration behind the book cover. I can understand why Billie-Jade felt that this scene stood out. I’d designed it to create a sense of sterility but at the same time to be slightly claustrophobic. It really represents life in the Neighbourhood where people are closeted away behind a boundary fence living a very restrictive and slightly oppressive existence. The title ‘Blinded by the Light’ also plays an important part in the cover. The Light are the governing body within the Neighbourhood. This government evolved from a pharmaceutical organization that discovered the cure for the Sandman Virus. Instead of sharing the cure with the general population they decided to make it available only to the people who could afford to pay. At the beginning of the book MaryAnn is literally blind to what is happening around her, as are many other people living in the Neighbourhood. During the course of the book MaryAnn’s eyes are opened and for the first time she’s exposed to the truth about the society she lives in. 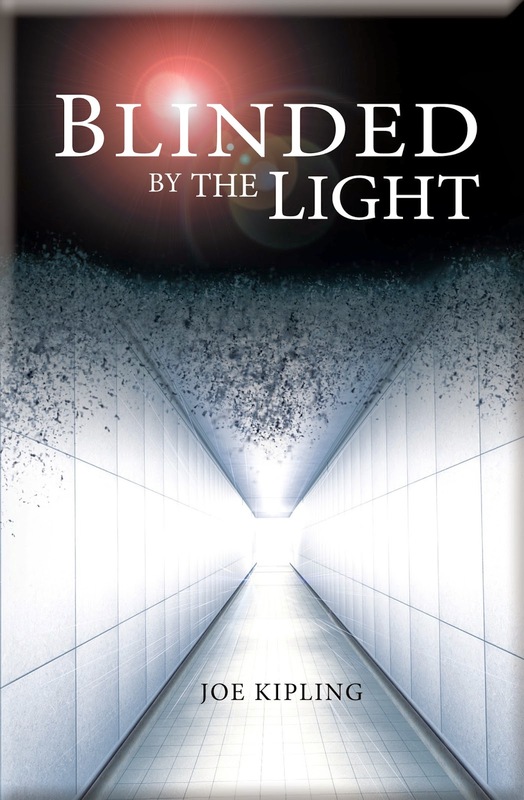 The placement of the flare behind the word ‘Blinded, is a deliberate attempt to make the title slightly uncomfortable to read, creating a brief illusion of blindness to the reader. Thanks Joe! I loved the placement of the flare - it's so pretty as well as doing what you wanted it to do! Joe also has a book giveaway on total teen fiction. Click here for more details. Make sure you check out the rest of the blog tour - the information on all the stops is below. It's a really great cover!